Conversion often sounds so vague when you are just starting out. However, as long as you know how, converting customers has a totally simple roadmap. The key factor that forms a typical conversion is when people see what they need. By simply breaking this process into step-by-step tactics, you can win the conversion rates battle without too much spending. Eggflow Apps Circle: How Eggflow apps step-by-step boosts conversion rates in your Shopify store. Martin Luther King, Jr. Day Special Offer: Get all Premium Apps with $19. Take a look at steps to gradually grow store traffic and boost your sales, using Eggflow Shopify apps. No matter how you want to start your drop shipping, attracting store visitors and increasing brand engagement are two basic tasks to begin with. Only with people knowing your business’s existence can your effort make sense. What if you can display your products as advertisements in the most high-traffic stores? Sounds great, right? This is something you can do with Instant Traffic. The app allows you to exchange ads with partner Shopify stores. Each store installing Instant Traffic is called a partner Shopify stores. And your products will get displayed in all the stores in this partner store network. To see how large the partner store network is, take a look at Instant Traffic on Shopify App Store. If you are seeking ways to boost store visitors dramatically? Holding an online giveaway may be an answer. Giving away a compelling award that anyone longs for is the perfect way to make people do what you want intentionally. The more compelling your award is, the more people join the contest. Going viral is no longer something out of your reach. Creating a giveaway will be quick and automated with Instant Giveaway. The app provides a ready-made giveaway format that you can use to create your own giveaway just with a few settings. Entries and Score are also automatically tracked to select the award winner. All you have to do is choosing a fabulous prize and creating a content that your customers can’t help saying “Yes”. Give the app a try, it’s worth your expect. Customer experience plays a decisive role in the conversion rate of your store. You are successful in driving traffic to your store. Now whether or not they buy anything is dependant on many factors, including their experience. Buying in your store should be easy, in both desktop and mobile devices. Given the fact that more and more people are shopping with their mobile devices, making the buying process quick and easy in mobile devices is critical. Among many things you can improve for an optimized mobile experience, Instant Buy helps you with the adding to cart process. The add-to-cart button created by Instant Buy is available at any position that visitors scroll to. Selecting product variants, adding products to the cart, or checking out can all be done immediately, without scrolling, long loading-time and with just a click. FYI: Creating an add-to-cart button is available in the app’s Free Plan, which means you can optimize customer experience in your store without any cost! Another thing you can do to improve customer experience is giving visitors a sense of safety and professionalism. In early 2018, Cambridge Analytica scandal, which cost Facebook more than $100 billion has raised an awkward question about the privacy of our online world. People are questioning all the online service about their privacy. One slight difference in the sense of safety can cost/ save you a lot. FYI: After the Euro’s General Data Protection Regulation (GDPR) came into effect on May 25, asking website visitors for their cookie consent had officially become compulsory. Violation of the regulation may lead to heavy fines that you don’t want to get. Not simply creating a banner asking for cookie consent, Shop Secure allows you to suspend the use of visitors’ cookies in your store until consent is granted. Leads flow: Collecting customer information, commonly email address. Smart Popup also allows you to rotate between 2 popups randomly on the same page to find the one with the best performance. We call this Popup A/B testing. Test it until you find the better. Since the last few weeks of 2018, Eggflow had geared up to develop a promising app to boost the conversion rate in your store. With powerful yet simple techniques of upselling and cross-selling, the app is expected to become your right-hand man and help you convert more into customers. From the 21 to the 23 of January, all Eggflow users have the chance to upgrade to the Premium Plan of ALL EGGFLOW APPS with $19, save $36 compared to ordinary charges. The charge remains unchanged throughout your subscription and only be canceled when you remove ALL APPS. Eggflow’s Martin Luther King Jr. Special Offer gives you access to not only the published apps. With $19, you become a Premium member that have access to the Premium Plan of any Eggflow apps in the future. That being said, you get not only 5 Eggflow Apps on Shopify Apps Store, but also the promising Facebook Ads, Google Ads, Upsales and Cross-sales apps that are planned to be released in near future. Just upgrade once and you get countless long-term benefits. The Event lasts 3 days from January 21 to January 23, consider wisely and act decisively, you don’t always get this kind of special offer. Why all of these apps? 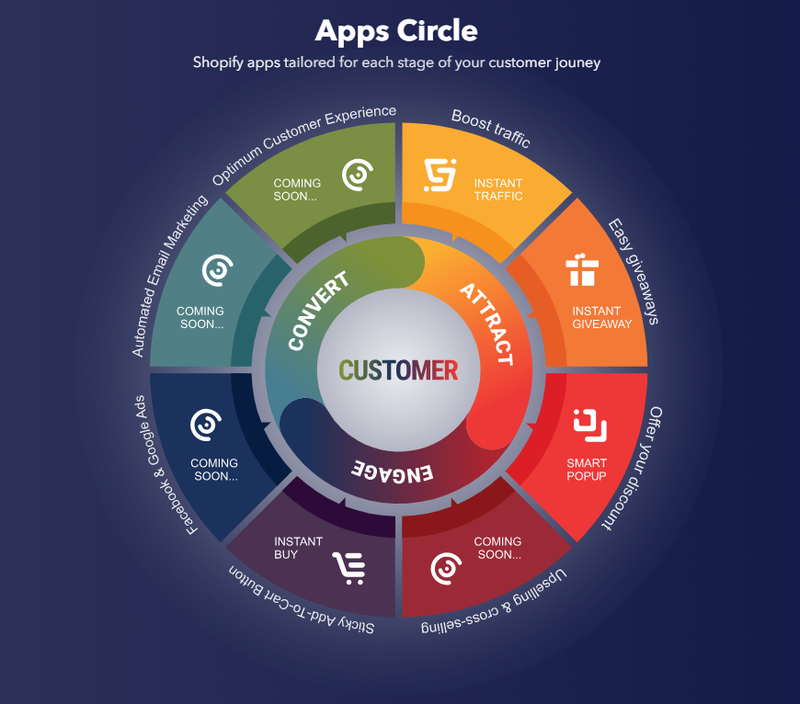 View report of all app in one dashboard, easier for you to track store performance. Install once, get 5 apps. MLK Special Offer: $19 for all (Save $36).